Orange Lace Dress (similar & such a good deal! + this one is almost identical): Fig Leaf Boutique. Brown Boots (similar): c/o Pink and Pepper (old). 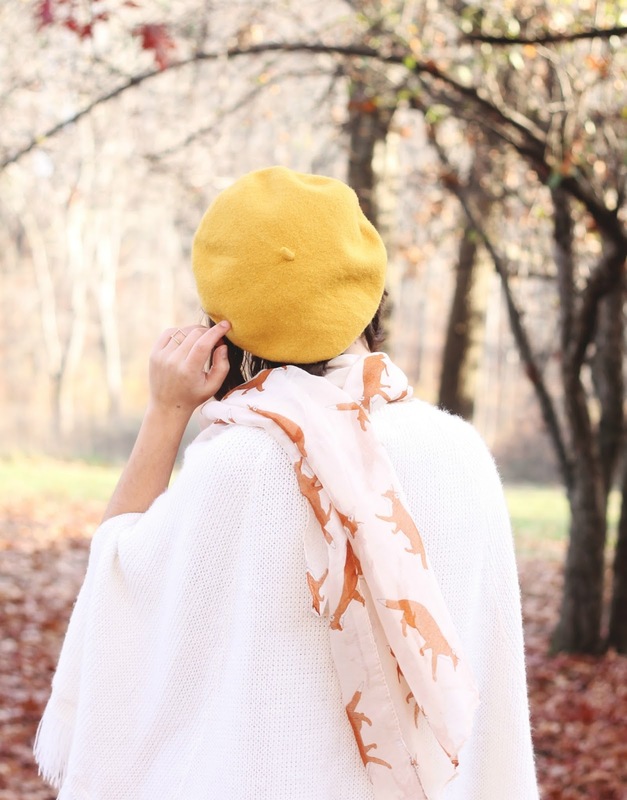 Fox Scarf: c/o Buttons and Blues. Also, a small side note. My adorable (& so soft!) 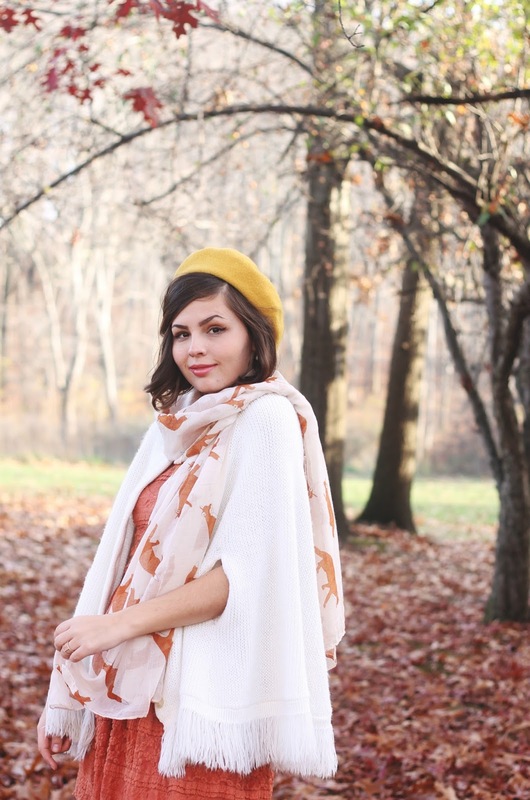 fox scarf is from a sweet online boutique run by a fellow fashion merchandising major. It's insanely inspiring to see someone in my field developing their career so well + early on, and I am a huge supporter of that! Check out her darling shop with all sorts of unique goods with swell prices. I love they way you write. I bet you could write for a fashion magazine or website. That would be great. I have been a big fan of this ensemble combo ever since you posted it on Instagram! 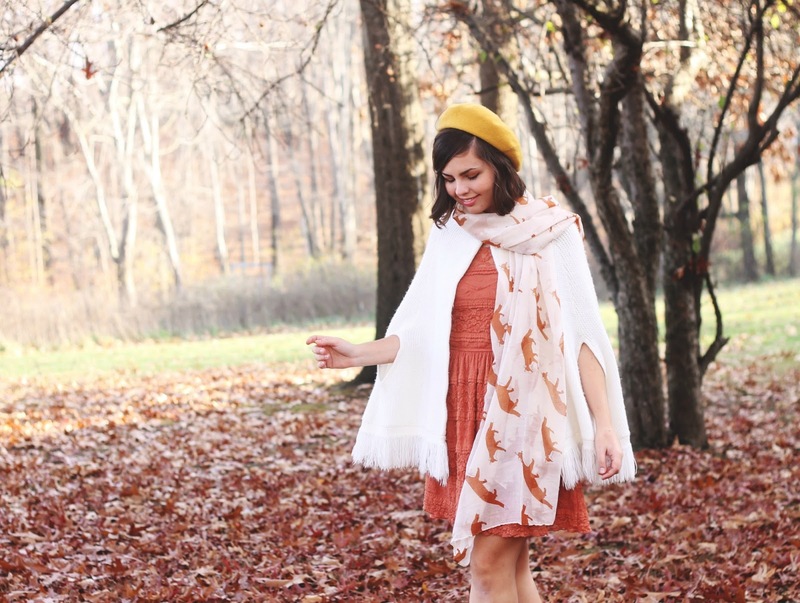 Those fall leaves just match so perfectly! Also, do you use a remote when taking your pictures? I pin fashion looks like no other but then I take almost no inspiration from them. Maybe from the colors or the poses or the mix of patterns, but I've never seen an outfit on Pinterest that inspired me to dress a certain way, and I think that's when you know you have a personal style and aesthetic. My inspiration comes from nature, but not in the sense of matching the colors of leaves, but matching the mood. 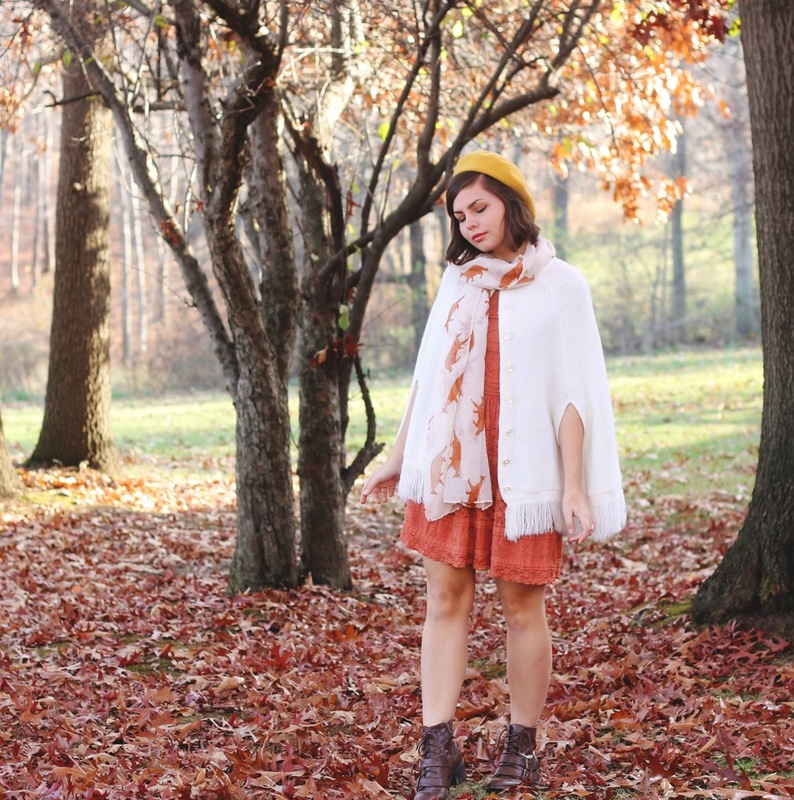 Windy days make me want to dress in long flowing layers. Cold days inspire me to dress in dress in lighter colors to match the color of the bitter cold. Nature is such a beautiful and ever-changing inspiration. Also, orange looks fantastic on you! 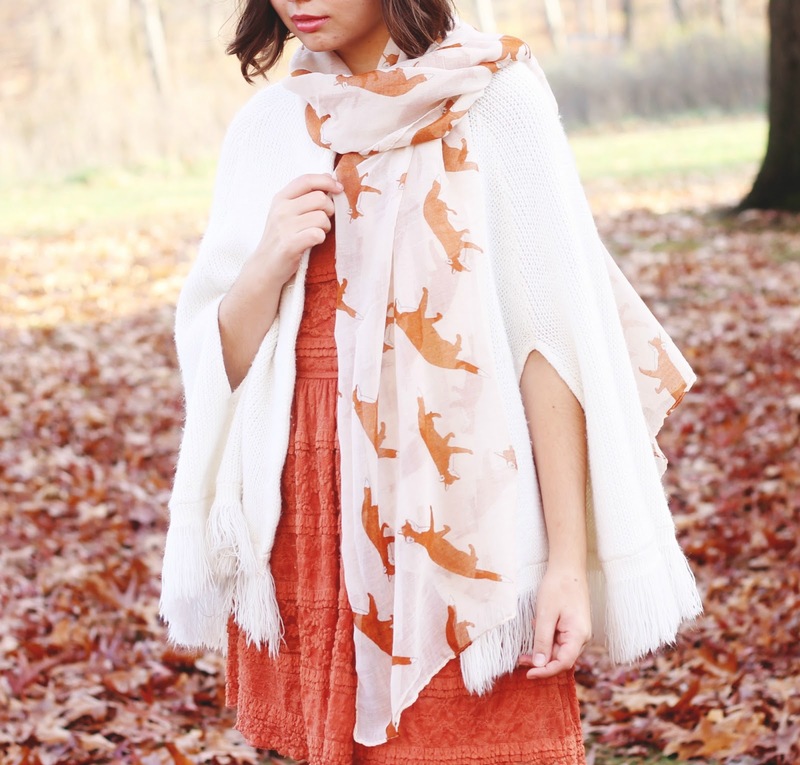 That fox scarf! It's so perfect paired with the orange and yellow color scheme going on here. 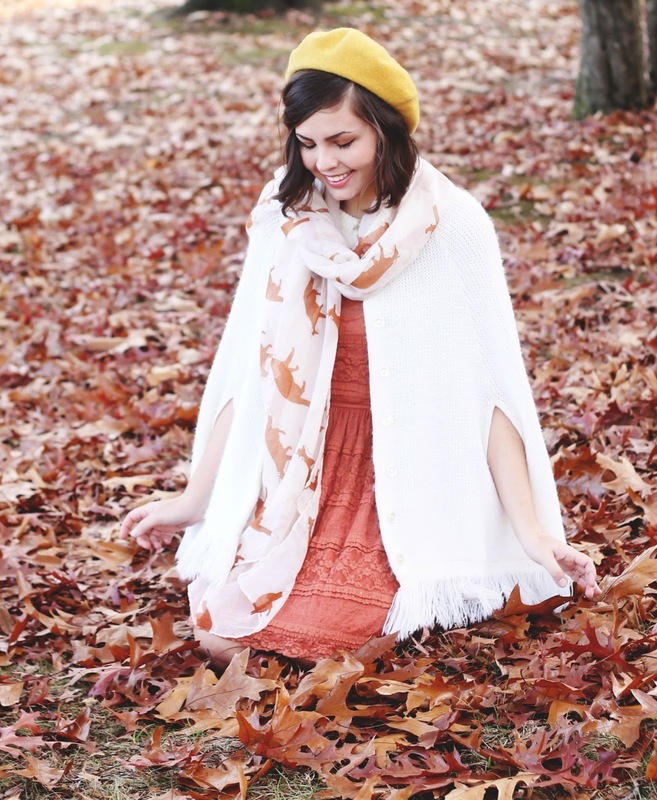 I love the fall shades and how comfy this poncho looks too.